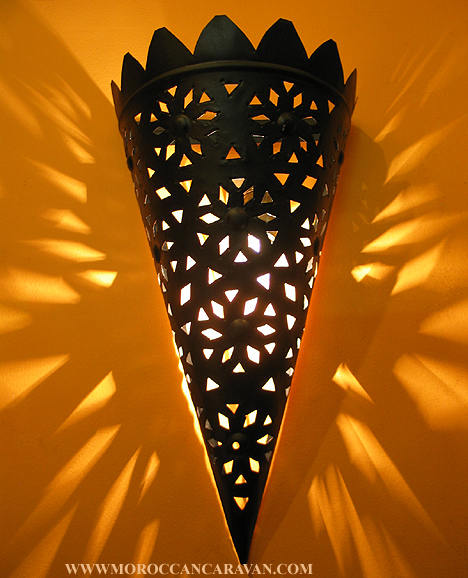 Moroccan punched metal sconce $10 OFF!! Regular $69. You save $10.00 per sconce!! This beautiful sconce is made from hammered and hand punched metal. It comes wired to be illuminated with a 40 Watt light bulb or less(clear bulb included) and watch it throw intricate shadows on the surrounding walls. It easily hangs on the wall by only one screw. Beautiful patterns of light come out of the openings cut into the sconce. This is perfect for interior decorating around your home. It also makes an exotic outdoor decorating piece at covered spaces such as covered patios, covered entrance ways. Not for places that get wet. You could also decorate with it to create a warm friendly work atmosphere in your office. It will definitely add an exotic accent to your space. As an idea, think about getting some of our lamps to finish the decorating.